Spicy zesty oven baked salmon with loads of flavor and minimal effort… just my kind of weekend dinner. Yet this baked salmon is elegant enough to serve at your next dinner party. Salmon is sort of my go-to fish. It’s colorful, versatile, distinctly rich, and one of the easiest fish to buy “wild caught” here in the US. Although I love to cook various white fish and tuna, salmon is the fish I try first with any new recipe concept. Its rich fatty flavor doesn’t get lost under toppings and sauces, making it a fish that even most meat-n-potatoes eaters will try. Also, salmon’s silky texture gives it a luxurious quality, making it not only an easy midweek option, but a dinner party favorite. 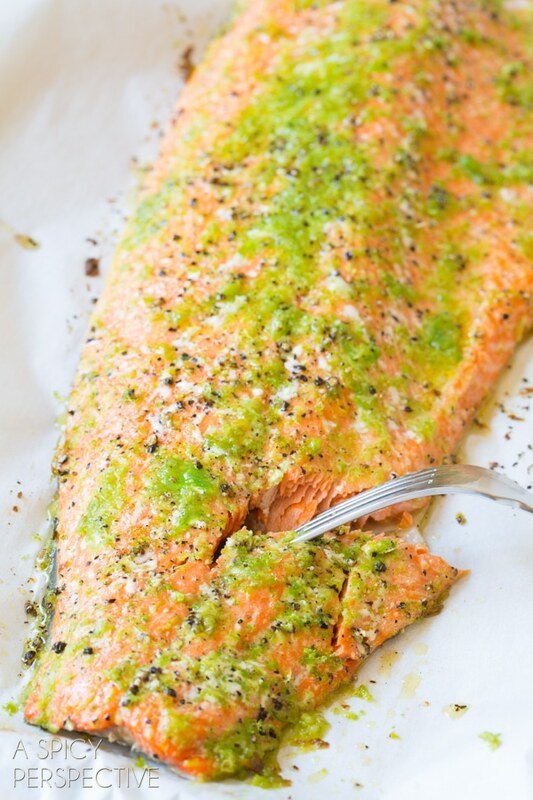 Today’s oven baked salmon recipe is one of my favorites for any night of the week. You can serve this particular oven baked salmon with easy grilled veggies for a quick and healthy weeknight meal, or dress in up with heavier side dishes for a lavish feast. I simply laid a whole salmon fillet on a parchment paper lined baking sheet. Then drizzled it with an easy mixture made of olive oil, garlic, lime zest and jalapeño. 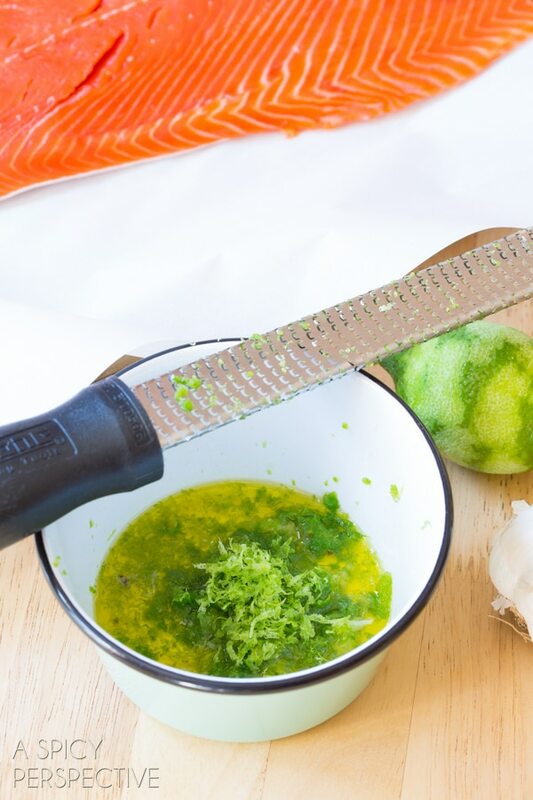 The bold and zesty flavored-oil seeps into the salmon while baking, creating amazing contrast, while keeping it moist. 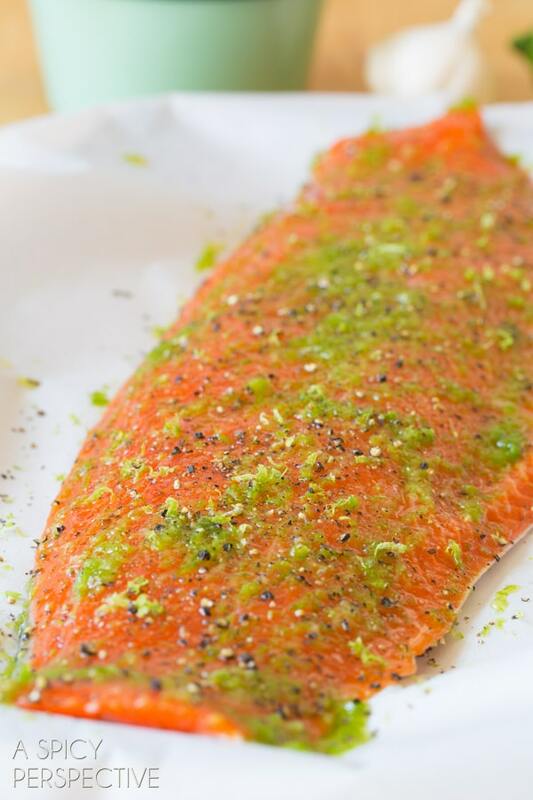 Oven baked salmon takes only minutes to cook through. One of the biggest mistakes when cooking fish is over-cooking. As with any type of fish, it should be cooked until just barely cooked through, so it flakes when pricked with a fork, but is still moist and tender on the inside. 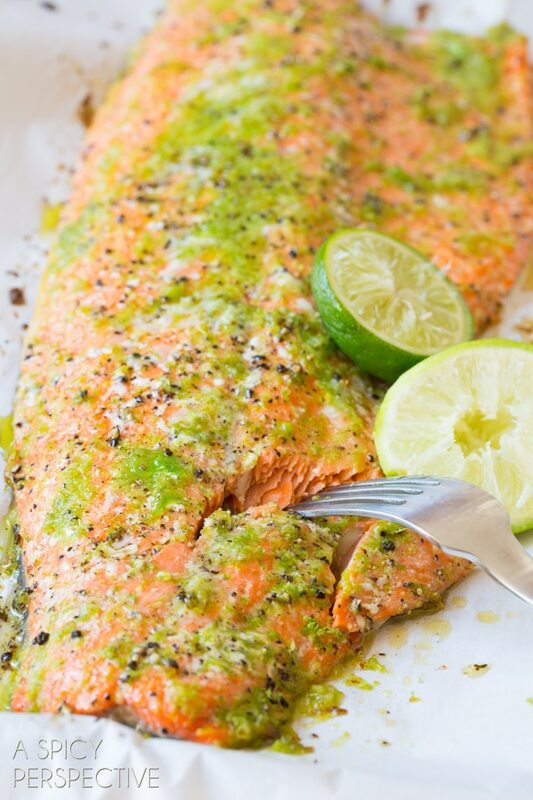 Spicy, garlicky, limey, tender and rich… oven baked salmon at its best. You could certainly buy single cuts of salmon and make the same recipe, but I guarantee, once you’ve tried it you are going to wish you had baked up an entire fillet. Spicy Garlic Lime Baked Salmon with Jalapeño. I made this a while back and thought it was delicious! Thanks you! I’ve already made this at least 6 times just for myself, and once for my mom, dad, sister & brother-in-law. We all agree… it’s simply delicious! I’ve never been that crazy about salmon, but now I’m a die hard fan. I do plan on having it another way one day, but I’m having a hard time trying anything else out, since this is so amazing! Not to mention fairly simple & quick to cook. I love it!!! A little late to the game, but I LOVE this recipe! One day, I’ll have to make salmon some other way, but for now this is my go-to way of making it. I’ve made it 6 times for myself & for my family (parents, sister & brother-in-law) who all loved it as well. I eat it with a whole avocado as a side, so tasty! I actually use twice the ingredients you call for, it literally covers the fillet with beautiful green, and is surprisingly never too spicy. Maybe I just love the heat? This recipe is memorized!!! Such a great recipe! Living in the Pacific Northwest and being part of a fishing family, we eat a lot of salmon. 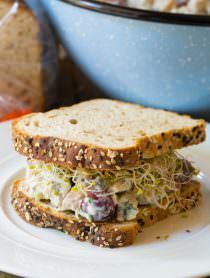 This is one of absolute favorite ways to prepare it. Easy to throw it on the barbecue in new payment lined foil for hot summer days when you can’t bear the thought of turning your oven on. I randomly googled this when i searched for salmon recipes with lime instead of lemon and this was jackpot. Its so simple yet awesome. This tasted SO good and was really easy to make. Thanks for this recipe. Definitely going to be eating more salmon now. I’ll be exploring the site for more recipes!! Thanks once again!! Made this the other night it was fabulous! I would like to try it with Tilapia. Do you think it would work? Really good salmon. My husband said I’m cooking the salmon from now on. This looks delicious. I’ll admit, I did not try this yet but it inspired me to create a lime, garlic and cilantro variation instead. I will sure have to try this one as well. Beautiful and creative. Made this last night and loved it! Moist and so flavourful, thanks for sharing. This looks delish and I can’t wait to try it!! Do you have any favorite side dish suggestions? Thank you! Can’t wait to try ur other recipes!!!!! Hi Suzanna, So glad you liked it. Thanks for sharing!!! With young children (and being a spicy wuss myself), I wondered if I should just cut waaay back on the amount used or if it would be better to sub in a milder pepper?? Thoughts? Hi Emily, It depends on just how spicy your jalapeño is… sometimes they are pretty mild. You can usually tell by smelling them after you cut the end off. Made this tonight. It was awesome, everyone loved it! Looking forward to making it again. Thinking of trying the same recipe with chicken. Just made this last night. Divine! YAY!! Thanks for letting me know Shaina. So glad you liked it! Do you happen to have nutrition info for this? Fabulous. Perfect for a springtime dinner party! It has been too long since we’ve had salmon and I know my guys would love this! 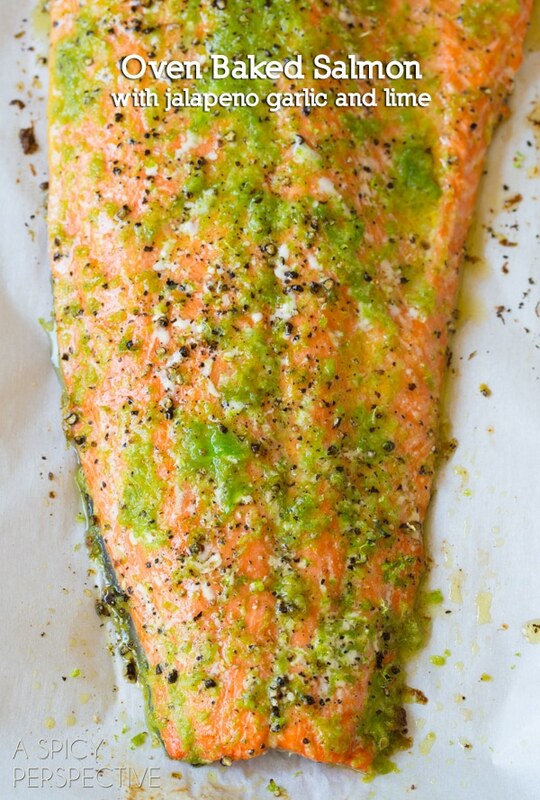 Gorgeous baked salmon, Sommer! Thank you for sharing. Pinning (of course)! Wild salmon is my favorite food. I eat it a couple times a week. I always bake it in whole fillets, but typically I just leave it plain to let the flavors shine through. I can’t wait to try these flavors on it! This looks phenominal!! I eat salmon every week, trying this next time! This looks absolutely delicious! I love how easy it is and the added kick from the jalapenos. Can’t wait to try this! This is my ideal meal!! Doesn’t get much better or easier! 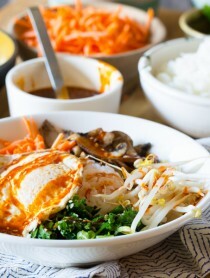 this is just beautiful- I think I am seriously going to make this for dinner tonight! We eat two kinds of fish in our house- salmon and tilapia :) WE’re always looking for new ways to prepare it. Thanks! Love! Now that I’m in the salmon capitol of the world I have to try this. Love salmon! And this oven version looks amazing! 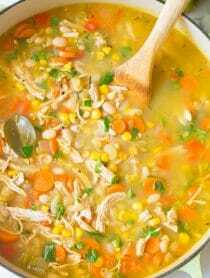 Zesty and with minimal effort–I’m on it! This is a great weekend night meal. Beautiful salmon, Sommer! Love the flavors! Love these flavors and salmon is always wonderful! Love the garlic and lime! love how simple this is Sommer, the colors look SO yummy against the pink salmon – pinning! This salmon is gorgeous. I was just thinking it’s been a long time since we’ve had salmon. Definitely want to try this. Splendid idea for weeknight dinner for us. Gorgeous, Sommer! 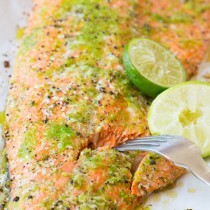 I love salmon, garlic and lime so I cannot wait to make this! YUM! Love salmon and always looking for new ways to prepare it, thanks! I’ve been on a major salmon kick these days! Looking forward to trying your recipe! I love how easy you’ve made this! It’s been a long time since I’ve made salmon. Looks so delicious and healthy. Just gorgeous. Have a beautiful Monday Sommer!